Of all the recent advances in technology, the one that I think will be most beneficial for journalists is the cell phone; more specifically, the cell phone camera. It used to be that newspapers had to employ a full-time photography staff with expensive cameras in order to get any kinds of visuals. Now, a single journalist armed with a smartphone can shoot, edit, and produce high quality photos and videos all on their own. Back in 2013, the Chicago Sun-Times laid off its entire 28 person photography department, and charged its reporters with taking their own photos using smartphones. 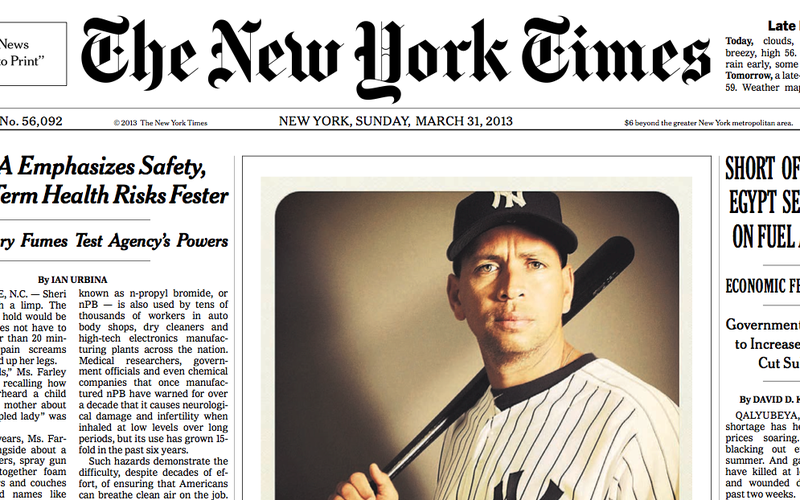 That same year, the New York Times ran a front page photo of Yankees star Alex Rodriguez that was shot on an iPhone and edited using Instagram. The value of having a high quality camera in your pocket at all times while reporting is huge. See something interesting that you could use in your story? Just whip out your phone and take a picture. No more need to spend time setting up your camera and fiddling around with the settings. Just frame the shot and tap your finger and you’re good to go. Smartphones also make it easier to get some good visuals on short notice. Last year, I covered a county legislature meeting for one of my broadcast journalism classes, but didn’t have time to check out a camera. Five years ago, I would have been screwed, but, thanks to my smartphone, I was able to get some good shots and audio that I used for my package. When I showed it to my professor, he didn’t even realize I had shot it on my phone. If you zoom in close enough, you can see the numbers on the jerseys that the fans on the opposite side of the rink are wearing. The quality is incredible, and all I needed was the small device that I always carry with me in my pocket. With the rise of digital media, every story needs a compelling visual of some sort. Gone are the days when reporters could just write their stories and let someone else worry about what kind of visuals would go with it. Reporters have become photographers as well. Luckily for us, smartphones make it quick, easy, and convenient to capture quality images, allowing us to spend more time focusing on getting the story instead of stressing about complicated camera equipment. This entry was posted in Blog on February 9, 2018 by mattristaino.